On Tuesday, May 1st , 100 parishioners gathered to crown Mary, the queen of our Church. Our First Eucharist Candidates led the procession. Alex Pohrte and Brayden Naum carried the crowns. Violet Bystrak crowned baby Jesus and Ava Molisani crowned Mary. Plan your own Crowning of Mary. 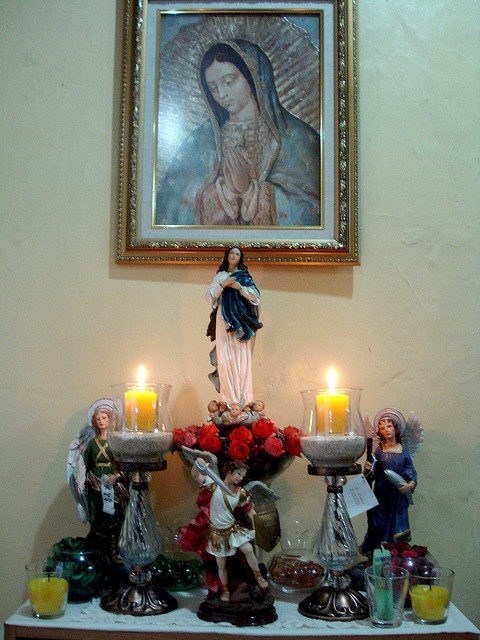 A May Altar is a dedicated space to honor Our Blessed Mother Mary during the month of May. It is a place where family may gather to pray for Mary with Marian devotions. Place a piece of white or blue fabric on a table, add a picture or statue of Mary (you can use your figurine from your nativity set, or a framed Christmas Card of Mary), flowers and candles. A novena is a prayer that lasts nine days. Nine is he time when Mary and the disciples waited from Jesus; ascension to the coming of the Holy Spirit. We pray a novena when we have a special need or intention or want to celebrate a special feast. Novenas may be prayed alone or in a group. How to pray a novena A novena may include particdluar prayers, hyms and scripture. It is prayed in the same way each day. Sing a Marian Hymn such as Immaculate Mary or Hail Holy Queen or Ave Maria.